As an international city of peace and justice, hosting a wealth of international organizations, nongovernmental organizations, and multinational companies, The Hague provides rich and fertile ground for developing innovative approaches to global challenges. By developing and fostering dialogue, interaction, and cooperation, The Hague Institute has a key role to play, in the city and internationally. During my tenure as Minister of Foreign Affairs I saw the need for a rich community of major international think tanks in The Hague that could inform the work of the government entities and international organizations located in the city. This demand for policy research and innovative thinking has only increased over the past ten years. In addition, it is important for The Hague to host first-rate internationally renowned think tanks that contribute to knowledge and critical debates on peace and justice issues. 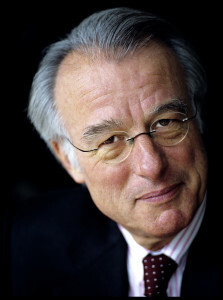 The Hague Institute for Global Justice was established precisely to provide an answer to this demand. As an international city of peace and justice, hosting a wealth of international organizations, nongovernmental organizations, and multinational companies, The Hague provides rich and fertile ground for developing innovative approaches to global challenges. By developing and fostering dialogue, interaction, and cooperation, The Hague Institute has a key role to play, in the city and internationally. The Institute is developing innovative, evidence-based, and policy-relevant projects with many international partners. Internationally renowned experts, both scholars and practitioners, find their way to The Hague to attend sessions at its beautiful premises at Sophialaan. It is with great satisfaction that we welcome Dr. Abiodun Williams as the first president of The Hague Institute. With his broad experience in the varied worlds of academia, peacekeeping operations, the United Nations Secretariat, and the United States Institute of Peace, he will be an inspiring leader for our young institute. 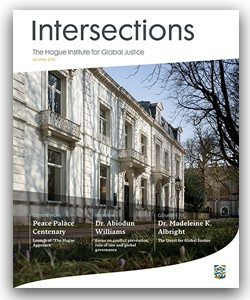 Our city considers it an honor to offer a home to The Hague Institute for Global Justice. I am confident that the Institute will make a lasting contribution to global peace and justice. We are a Think and Do Institute. Learn more about our philosophy.